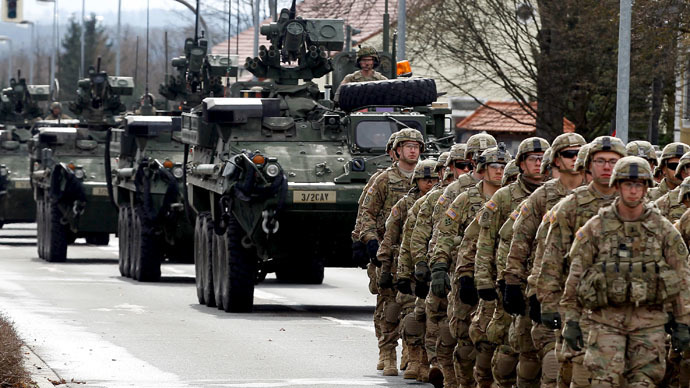 The US regiment involved in a much-publicized ‘Dragoon Ride’ mechanized tour across Eastern Europe in a gesture of support against ‘Russian aggression’ has asked for 30-mm cannons as new addition to its arsenal. The Germany-based 2nd Cavalry is to have 81 of its Stryker infantry carrier vehicles fitted with 30-mm automatic cannons, according to the websiteBreaking Defense, citing a Department of Defense memo.The Army officially approved the urgent upgrade and the House Armed Services Committee is already setting aside money for it. The cannons would be twice the caliber of the standard .50 BMG (12.7 mm) M2 Browning machineguns that the vehicles are normally armed with and would give the American vehicles a significantly greater punch. The M1126 Infantry Combat Vehicle (ICV) variant of the Stryker family vehicles is equipped with a Protector Remote Weapon Station, which can have a machinegun or a grenade launcher mounted on it. Back in 2008 its producer Kongsberg Gruppen worked with Stryker maker General Dynamics Land Systems on a new platform called Medium Caliber Remote Weapons Station (MCRWS), which would support a bigger 30 mm cannon. The MCRWS looks like a turret, but it’s actually not, as it lacks a basket extending down. The Pentagon has an even heavier Stryker variant called M1128 Mobile Gun System (MGS), which is armed with a 105 mm tank gun. The 2nd Cavalry paraded 60 of its Stryker vehicles last year in a tour to the Baltic States, Poland and Czech Republic. The “dragoon ride” was meant as a confidence-building gesture to the NATO members in the light of what the alliance calls ‘Russian aggression’. The introduction of the improved Stryker ICV’s was justified by the US Army’s needs in Iraq and Afghanistan. It underwent development during this period.